Originally constructed circa. 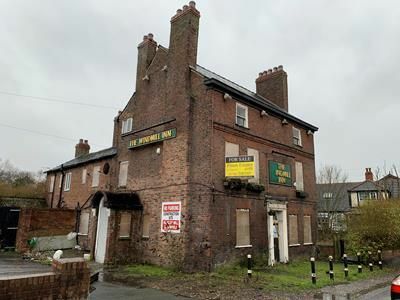 1700, this is a substantial former public house with car parking area and beer garden located to the respective sides, constructed over basement, ground, first and second floors. (Please note the rear bowling green is not included within the proposed sale - please refer to indicative site plan overleaf). The property is being cleared internally to provide a shell finish with bar/lounge areas to the front around a central bar with male and female WCs, former bar/pool room with office, kitchen and store areas beyond. Access is also provided to the beer cellar/store from the ground floor area. The upper floors were historically the manager's accommodation and comprise four bedrooms, lounge, kitchen and bedroom to the first floor, with further rooms and storage to the second floor. Plans have also been prepared to show a side extension, and the upper floors are capable of having an independent access from the side cobbled car park area, subject to the necessary consents. Previous Planning Applications for the conversion of the upper floors into student / hmo accommodation have been declined by West Lancs Borough Council, but the property does lend itself to the reinstatement of the bar/restaurant to the ground floor areas, with the upper floors being suitable as letting rooms/air bnb, offices, non-hmo residential accommodation, etc.